Our custom fender socks come in a choice of materials and colours. For our ‘Super’ fender socks, we use a top quality reinforced twisted yarn. This elastic fabric has a stable and high rubbing resistance giving a longer life cycle. 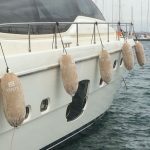 Our Towelling fender socks offer great noise muffling, however care must be taken as sand and dirt can get stuck in the fabric with the potential to scuff gel coat.We highly recommend this fabric for varnished and sensitive / precious hulls. Unlike Towelling, our Velvet fabric has open polar fibres where sand cannot settle. Similar to animal coats, the velvet like surface is highly dirt-resistant. Due to the velvet outer, the underside is protected and makes fabric very resistant to wear and tear. The jacquard knitting lets the surface look less tight than with plain velvet. We highly recommend this fabric for varnished and sensitive / precious hulls.In common with all our fabrics, our fender socks are fade / UV resistant and rot proof. All our fabrics are fade / UV resistant and rot proof. All fabrics can be machine washed at 40° and dry quickly in the air. Please do not tumble dry. Our fender socks are made to measure and are available in a choice of 8 basic colours. They can be fully customised to include boat manufacturer logos and / or your boat name in a font and colour of your choice. If you would like us to give you a quote for our custom fender socks, please give us as much information you can regarding your requirements. 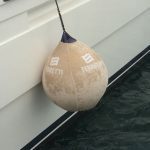 In particular, the quantity and size of your fenders, your preferred material / colours and whether you require a boat name of other logo embroidered into the material. 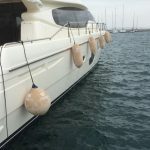 Whilst our fender socks are highly resistant to wear, to protect them we advise their removal when mooring against rough quay walls (they are fabric after all). This is easily done due to elastic fabric qualities.